I'm in seasonal slow-down mode right now, which means it's going to be a little quiet around here for the next few months. Of course, I can't ever really stop making things, so I'll pop every so often with whatever little project I've been working on. 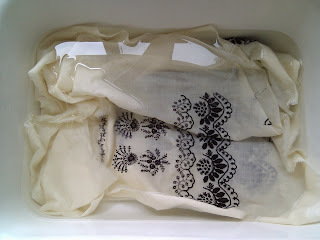 Today's post is about an antique parasol frame I just acquired. 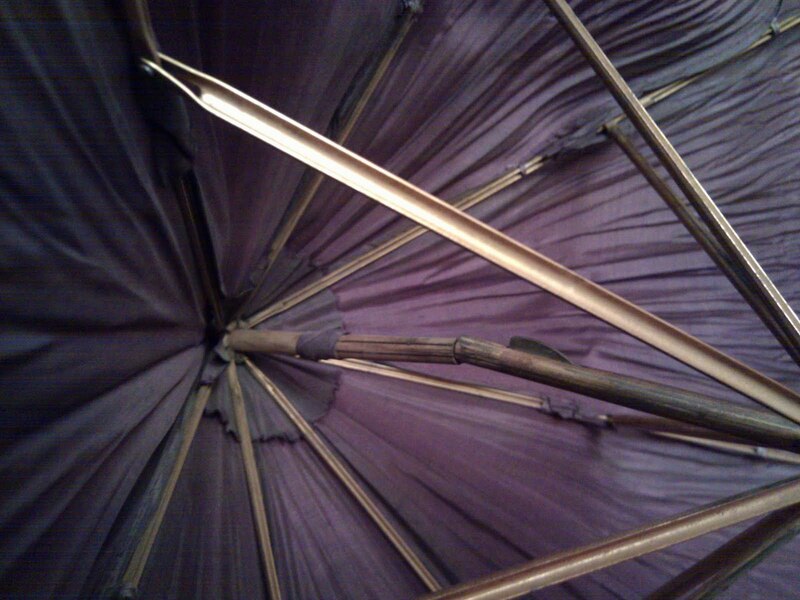 I collect antique parasols and, well, let's just say I have a few. I bought this one because it has some unusual and unique features. canopy is detaching from the ribs, so it's not open all the way here. The colors in these photos are not great, sorry! These are just some quick snaps, I'm too excited to get out a real camera. 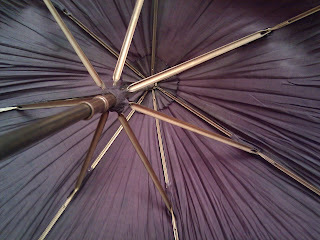 The canopy is a dusty, grey-purple color. An area under the rosette on the handle, where the rosette is coming loose, shows that the color was once much lighter and less grey. The canopy has separated from the ribs in three or four spots, and is threatening to come off from several others, so I didn't open the frame all the way for these pics. Some mis-matched stitching indicates that someone once tried to reattach the canopy to the rib points. Besides the big tear you see here (more on that later), the fabric is in pretty good shape, showing some initial splitting in just two panels. hollowed out undersides, formed out of folded sheet metal. Older ribs are made of solid rods. The frame is in excellent shape. The hollowed out shaping of the ribs and spreaders make me think this frame is rather late, relatively speaking, maybe 1900 or 1910; I haven't researched when shaping metal like this was developed, so I'm really just guessing. But that date makes the size of this parasol (the canopy is about 24" across when open) unusual and contrary to the popular belief that parasols were quite large around 1900 (which supports what I've been told and often repeat: there are no "rules" when it comes to parasol sizes). The frame has a tilt hinge (also called a Marquis hinge), which the seller didn't mention and I'm delighted to find. Tilt hinges sort of disappeared as parasols got larger through the 1880s (you don't really need one with a large parasol) so this is yet another unusual feature (but a logic one for such a small canopy). the handle and the handle's end caps. The handle, which appears to be a hollowed out section of bamboo, has several stamps on the body and the end caps, that I'll have to investigate further. 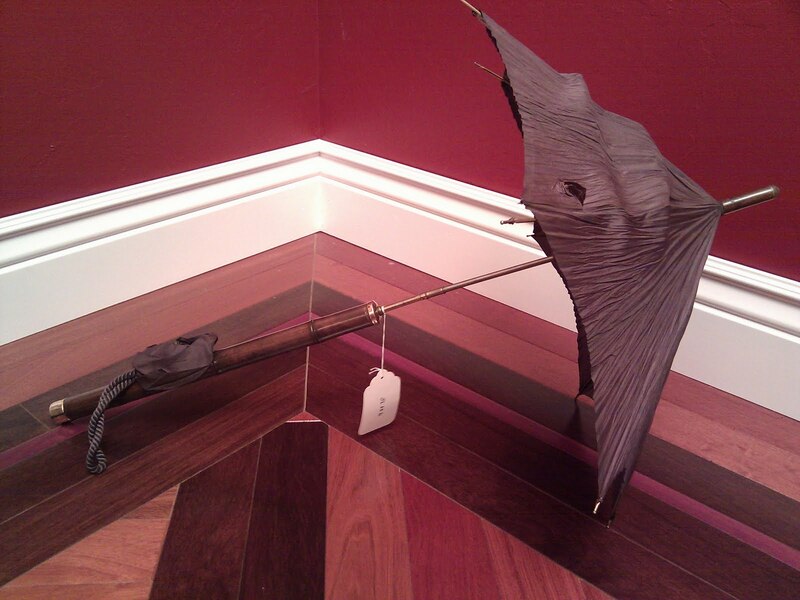 There's a large and probably very modern paper tag hung around the frame, and also a tiny cloth tag stitched to canopy, next to one of the ribs. The paper tag has some mysterious numbers on it, and the cloth tag has "45.5 Houston" written on it. 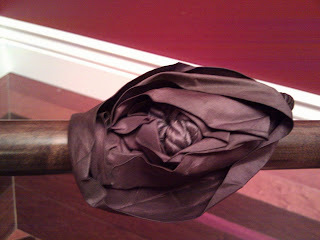 The large (and smushed) rosette attached to the handle. The rosette is very large and more than a little smushed. It appears to be a strip of fabric, folded in half lengthwise, and sewn in circles around a knot in the cord. 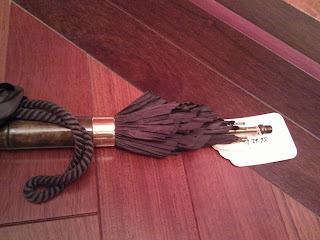 It's attached to the handle with a band of matching fabric. The canopy fabric is probably very wrinkled taffeta. The seller described the fabric as "crepe" and it certainly has the look and feel of crepe paper. But it's definitely silk, so I went to my copy of All About Silk, by Julie Parker, to see what it might be. It's definitely not what we modernly call silk crepe, it's much stiffer. I'm of the opinion that it's a taffeta weave, a very fine and thin one. So why does it look so wrinkled? Read on. The frame unscrews from the handle. Here you can also see the two tags, both of which are quite cryptic. ...and then goes into the handle! And this is why I got so excited about this parasol! The handle is very fat, and hollow. That fact, the very wrinkled nature of the canopy, and the length of the upper frame, indicated to me that the canopy was meant to be stored inside the handle! I've seen a handful of umbrellas-inside-walking canes (which, to my knowledge, would only have been carried by men). This would be the first parasol I've seen that comes with it's own case. The tear in the canopy is supports my conclusion. It's not consistent with the usual age-related splitting, and it looks as if the fabric caught and was pushed down, resulting in a tear. The opening at the bottom of the handle is brass and slightly dented, and I can imagine the fabric getting caught on this. This is as far as it would go without forcing it. This is as far as it would go in without some force, so I left it there. This method of storage probably explains why the fabric is so incredibly wrinkled. Eventually I'm going to replace the canopy fabric, most likely with taffeta, and how the new canopy will look after being stored like this will confirm or deny my assumption that this is how it was meant to be stored. I've been trying for years to find hat boxes that fit my really large, period hats. 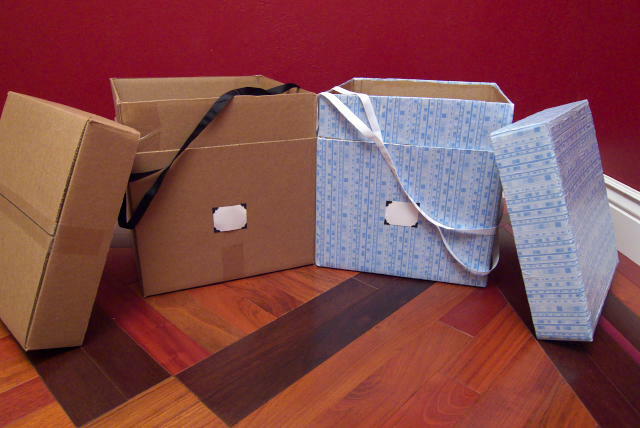 I have not yet succeeded in finding boxes that are the right dimensions. I've made hat boxes before, the classic round style with a lid and cord threaded through grommets...but egads, that took some time, and I used only archival quality materials, which made the box not exactly cheap. 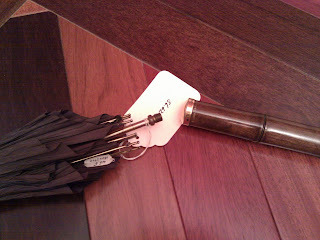 a tag for identifying the contents and a handle for carrying. 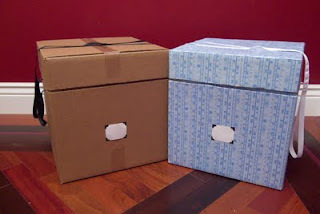 The boxes are double-walled, thus very sturdy. 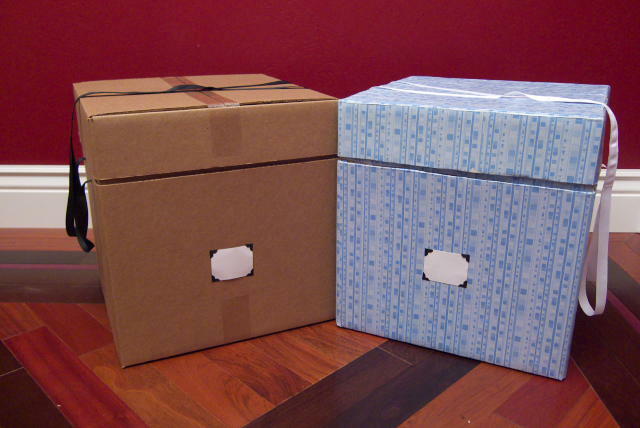 Both boxes are 15 inch cubes, sized to fit my enormous 1830s bonnet. Totally not archival quality, and probably not as durable as a properly made hat box (well, maybe the papered one might be). But they solved my problem, and now I can store my big hats properly. 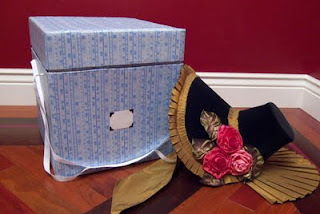 The box is sized to fit my enormous 1830s bonnet. 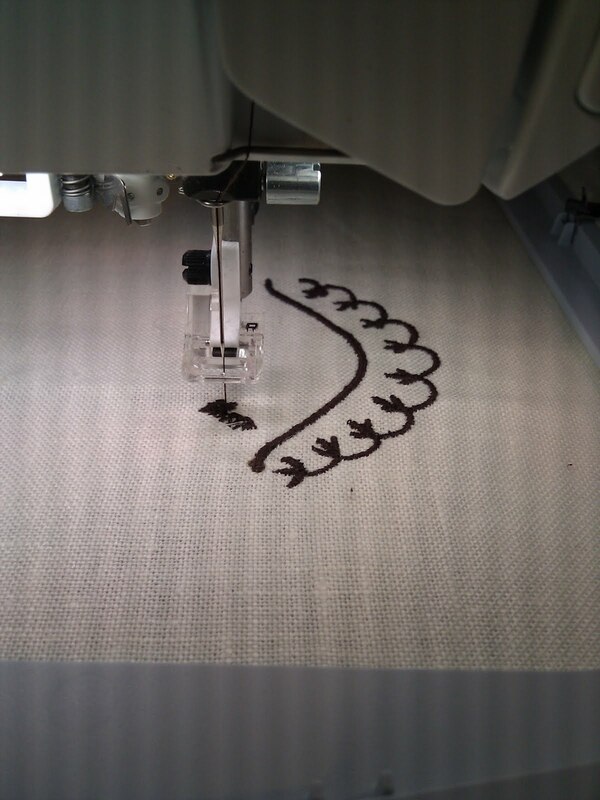 I've gotten a couple of requests to explain the process of doing machine embroidery. 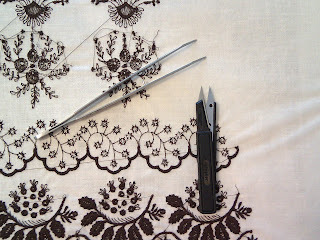 In this post I'll go through the steps, using as an example the embroidery for a parasol canopy. 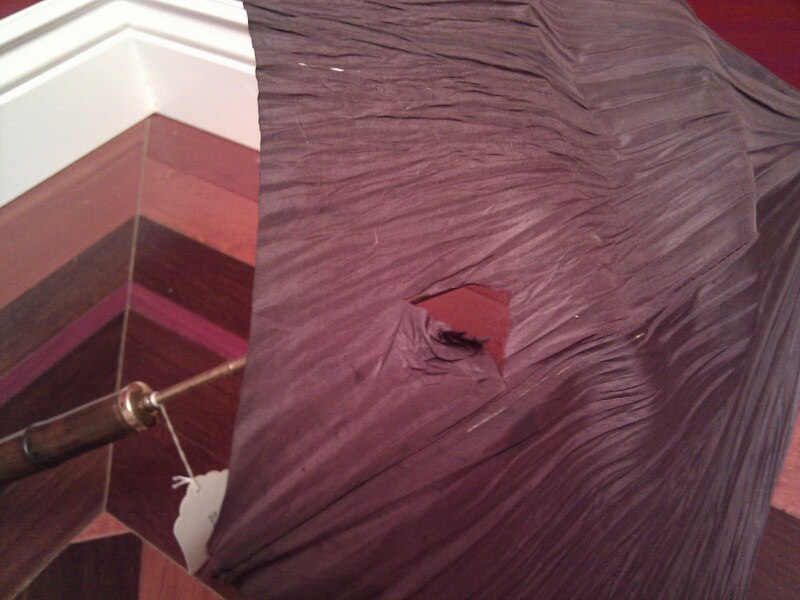 Restoring this particular parasol is something I've been working on in fits and starts for years and hey, it's time to get it done. 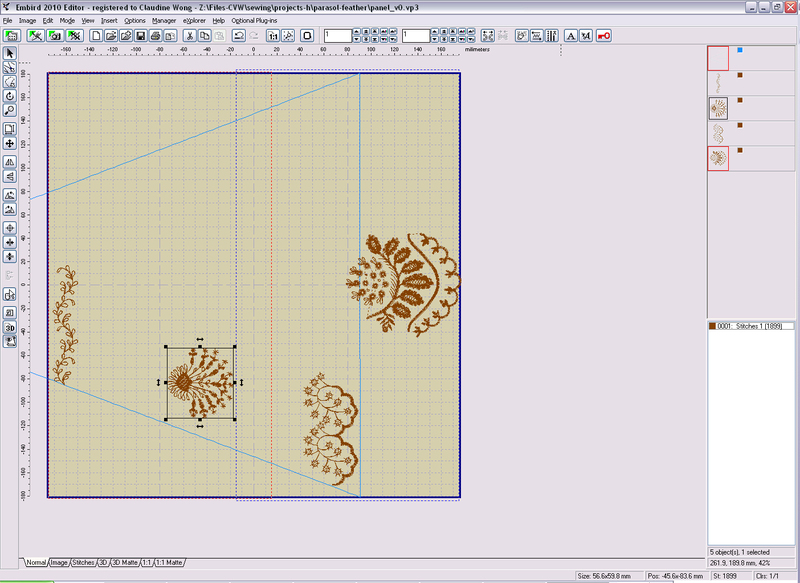 To manipulate embroidery designs, I use a popular software application called Embird (www.embird.com). 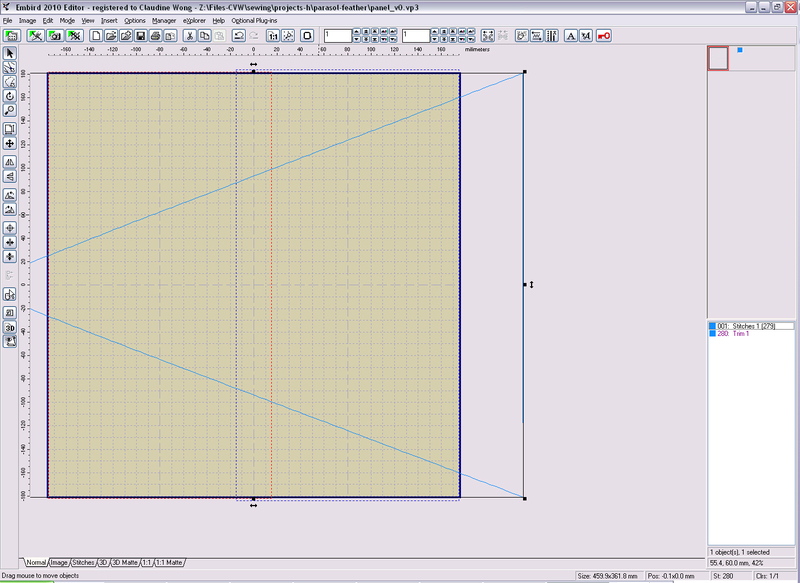 It's immensely powerful, and quite a bit more affordable than the software put out by the sewing machine companies. 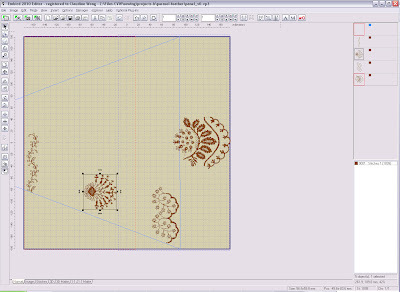 I can arrange embroidery designs right on my machine, but I find using a computer far easier, flexible, and more accurate. For this project, the first step was to scan the pattern for the canopy's panels (the process of making the pattern isn't relevant here, so I won't get into it). I uploaded the scan into Embird, and created an outline of stitches out of it. This is so that I know what area to fit the embroidery into; I won't actually stitch out the outline in this case, because it won't fit into the hoop and isn't strictly necessary (it would merely be handy). Outline of the canopy panel (blue triangle), over the hoop (tan area), in Embird. to place the designs. I'll erase the outline from the final design. Next, I picked the designs I want to have go onto the panel. 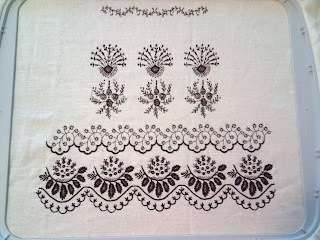 These designs are from OESD (www.embroideryonline.com). I use purchased designs whenever I can. I've created designs from scratch before (a process called "digitizing") but doing so can be very time consuming. 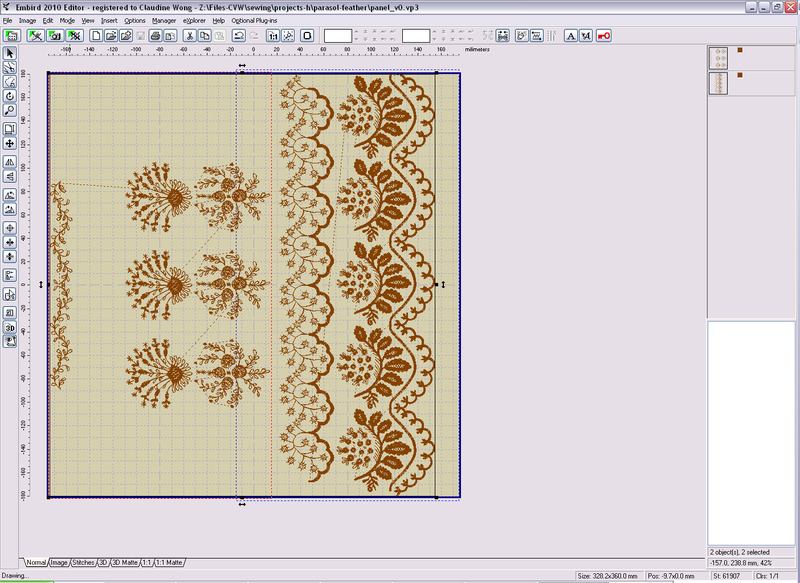 So, I try to find patterns that will do the job before I consider digitizing something from scratch. Here, I already had these patterns from earlier projects, so only had to pick what I wanted. The design contains five purchased elements (four pictured here) from OESD. Since I already had these elements, I didn't need to digitize any from scratch. When arranging these elements, I tried to place them so that the jumps between them are really short or insignificant. My machine trims jump stitches on the right side, but not on the wrong side. 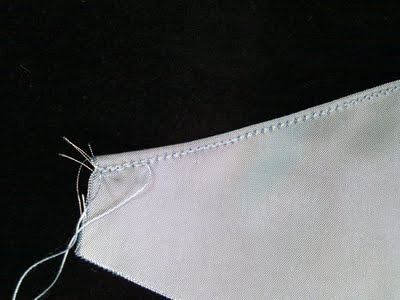 Thus, jumps on the wrong send will get stitched over, making them harder to remove. So, since I need the wrong side to look as clean as possible, I tried to keep the jumps short. At this point I checked that trimming codes and stop codes were in the right places. This design is all one color, so I wanted no stops. I also made it trim almost all (but not all) the jumps. You'll also notice fine blue and red lines running down the middle of the hoop. These indicate the right and left areas of the hoop. With this large hoop, the machine stitches all of one side, then all of the other, so the design needs to be placed such that stitches from one side don't overlap into the other. the left-to-right placement in the hoop. 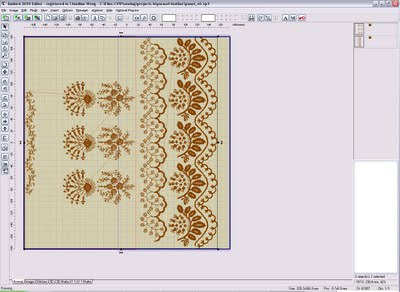 Normally, you would now check that the design is ok, by doing a stitch out, on scrap fabric, of all or part of the design (it's a good idea to test elements you grew or shrank). I confess to being rather impatient with this project, however, and forging ahead. The base fabric for the canopy was a medium weight, cream linen. 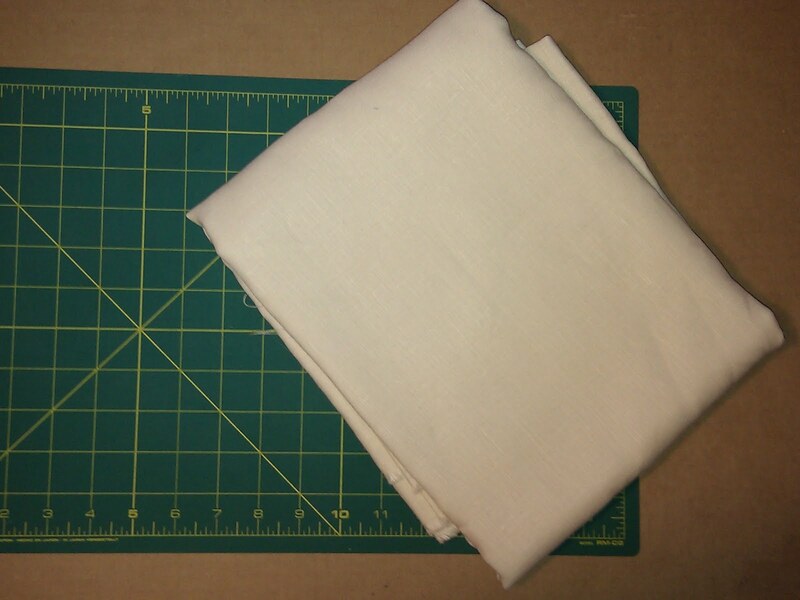 The base fabric for the canopy: medium weight, cream linen. For the top thread, I used a cotton quilting thread. I figure this approached what might have been done historically. Also, it has a slightly heavier weight than sewing thread, closer to that of rayon embroidery thread (but without the shine of rayon). For the bobbin I used a poly sewing thread. 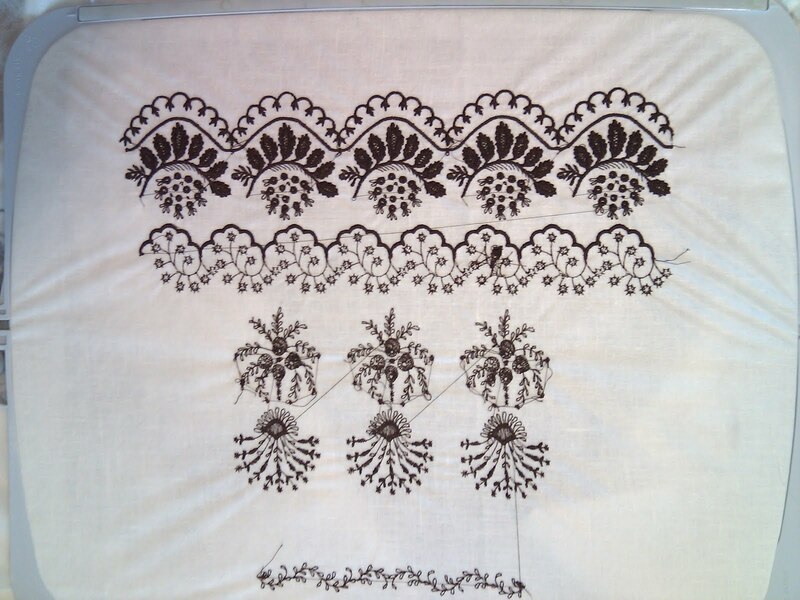 Generally, I embroideries come out better if the bobbin thread is really light weight, and thus there's specialty "bobbin thread" for machine embroidery. 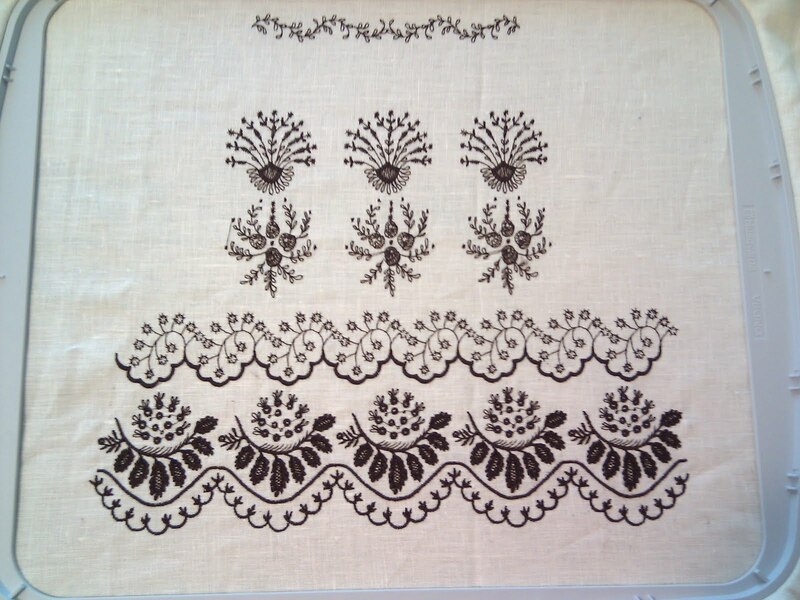 As far as I know, however, it only comes in white and black, which wouldn't work here, since I expect the back side of the embroidery to be seen. 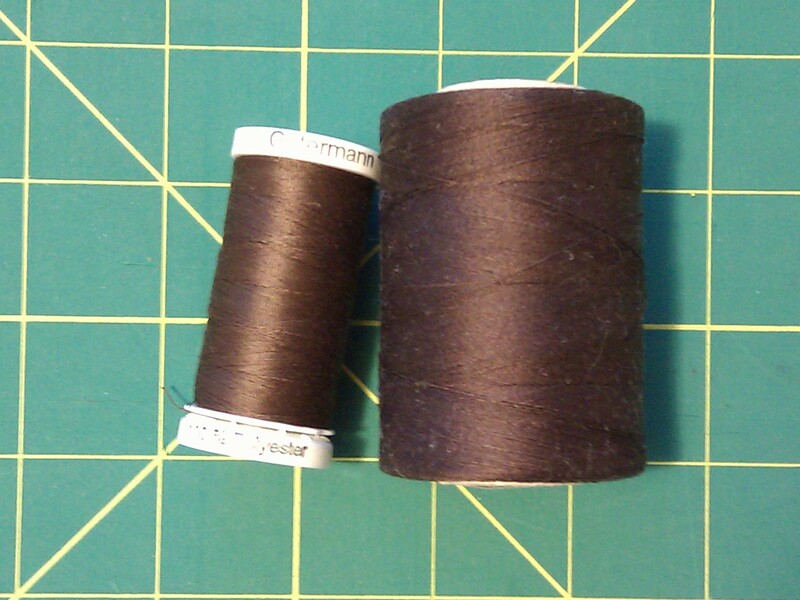 Left: poly sewing thread, for the bobbin. 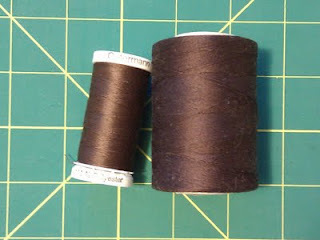 Right: cotton quilting thread for the top. The next step is to hoop the fabric and stabilizer. 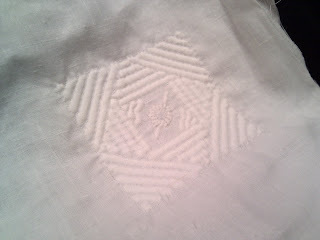 Since I expect the wrong side of the embroidery to be seen, I used a water soluble stabilizer underneath the fabric. soluble in this case), fabric, and upper hoop. The machine goes to work. I wandered off and did other things. After one side finished, I rotated the hoop and continued on the other side. and do the other half. And now the whole thing is done. Before I popped it out of the hoop, I trimmed any remaining jump stitches on the front side, and also the jump stitches and dangly threads from the back side. Leaving the fabric in the hoop keeps it taut and makes this step go faster. My favorite tools for trimming are a pair of long tweezers and short thread snips: the tweezers raise the thread from the fabric, and the thread snips can get close to the surface of the fabric. Once I cleaned up jumps and loose threads, I removed the fabric from the hoop, I trimmed away extra stabilizer, re-hooped, and started the next repeat. I was stitching along the selvedge edge of the fabric, so once I had four repeats, they went into my kitchen sink for a short soak, and then over a rack to dry; once dry, they were ready to cut out. Four panels getting a soak to remove the stabilizer. Except: I need the other four panels to complete the canopy. 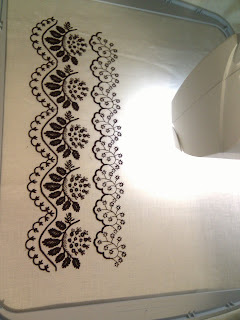 This, it turns out, is a large design, with over 55,000 stitches. Frankly, that quantity of stitches takes a long time to stitch out. I also learned that with this large hoop (the largest that fits the machine), the embroidery arm moves more slowly than it does with smaller hoops. 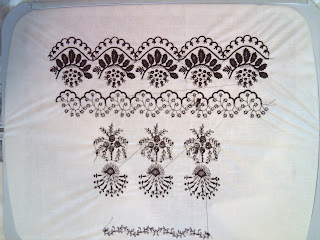 Thus, each panel took a veeeery long time to stitch out, approximately THREE hours of stitch time. That's stitch time, which excludes time to change bobbins, rotate the hoop, and deal with broken threads (It happens. Often. You learn to live with it.) And I needed EIGHT panels! I had wanted to finish this parasol before a certain date. I totally failed. So, I say lesson learned: pay attention to the stitch count! 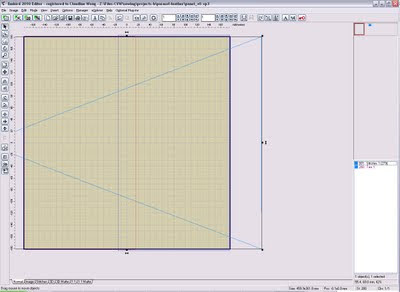 I could have simplified the design, and some areas are still too dense, which didn't cause problems but means the time wasted on unnecessary stitches. I'm going to wrap this project up soon. As of this writing, I still need the eighth panel. I also need to do the restoration work the frame needs. When all of that is done, I'll report back. Stay tuned. EDIT 11/25/11: I removed the canopy from the parasol and just got 'round to putting it back on, so I retook the photos for this post. Sorry it took so long! EDIT 8/10/11: I realized that I made a small mistake in explaining how to attach the canopy to the ribs. I've removed the incorrect photos. When I get around to doing another parasol restoration, I'll post new photos. Hot on the heels of Part 1, here's Part 2, so that my gal-pals can finish up the parasols they were working on yesterday. 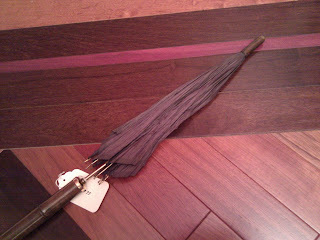 Gals, I expect finished parasols! And photos!!! In this post I'll explain how to attach the canopy to the frame, in somewhat nauseating detail, so that hopefully this process is clear. 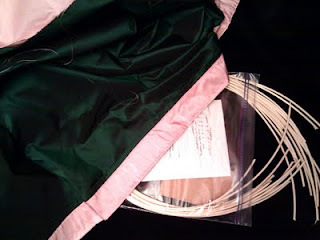 What you need: buttonhole twist, preferably silk (I used cotton-covered poly, because that's what I had handy), and a needle with an eye large enough for the buttonhole twist, but no so large that it won't pass through the hole at the tips of the ribs. First: put the canopy on the frame. Yes, really. Second: attach the canopy at the tips of the ribs.This is where the buttonhole twist and needle come in. 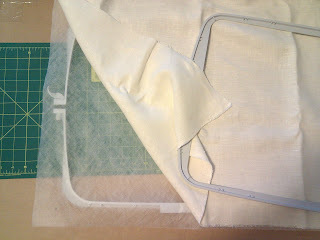 1: Fold the fabric over the rib. 2: Pass the needle through the folded fabric, and through the hole in the rib tip. 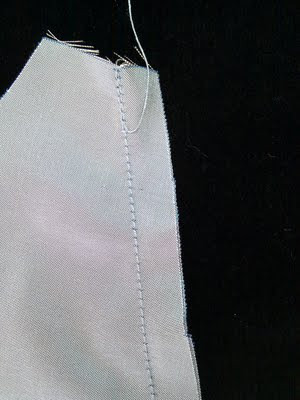 3: Pass the needle through the fabric and the hole again. 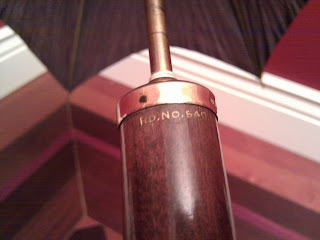 4: There should be a loop underneath the rib tip. 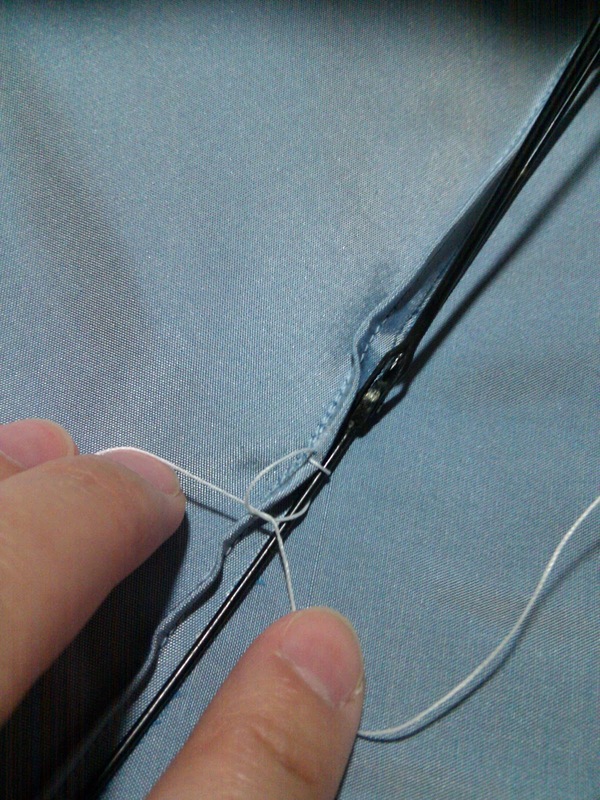 Pull the ends of the thread so that the loop is taught. 5: Make one overhand knot. Don't unthread the needle, so that it's ready for the next one. 6: Make a second overhand knot, so that you have a square knot. 7: Make a third overhand knot. 8: Trim, leaving short tails. Next: attach the canopy to the ribs.This helps the canopy to behave properly, and I've seen it done, in some form, on every antique parasol I've ever seen. I'm going to go a little quicker here. 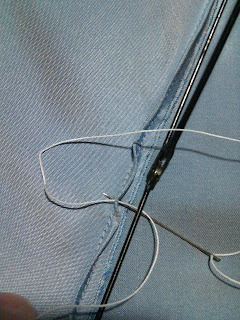 1: at a point 1 to 1/2 inch below the hinge (towards the rib tip), pass the needle under the rib and through the seam allowance, twice. 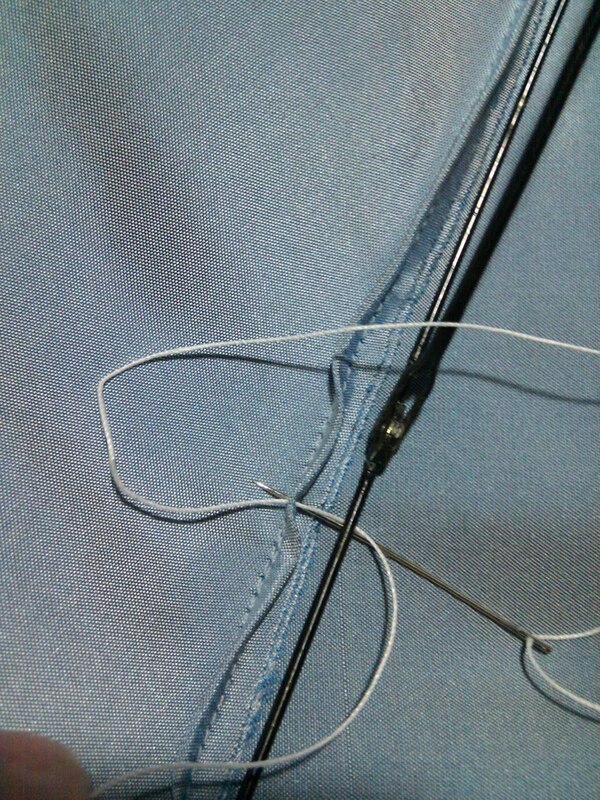 Because this is a very small canopy, I'm putting these stitches about 1/2 below the hinge. On a larger frame, 1 inch works better. 2: tighten, and make three overhand knots like you did on the rib tips. 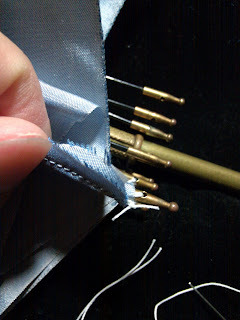 Trim the extra thread, leaving tails. 3: repeat 1 to 1/2 inch above the hinge. I'm going to stop here, because I'm going to finish attaching the canopy in a manner more similar to how the original canopy was done (a slight variation from what I just explained). I did finish attaching the canopy to the frame, which makes this parasol ready to go...but, of course, I can't leave well enough alone! This parasol will also get a lining (just like it had originally), and TRIM. But more on that later. Yesterday I lead a workshop for five of my girlfriends, in which we recovered parasols. 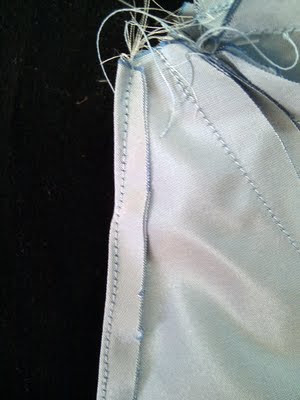 This post is basically for their benefit, because I did a pretty botched up job explaining how to do the seams. Gals, skip to the photos. 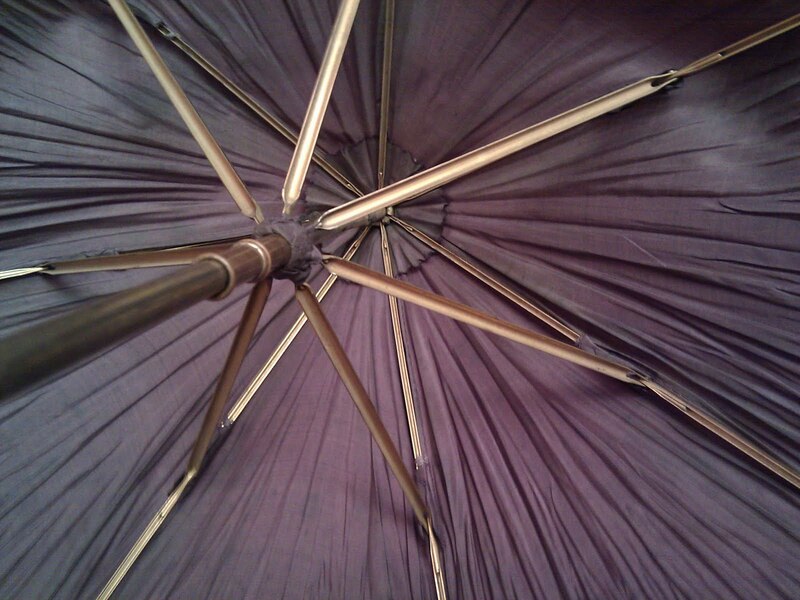 For those of you who weren't there: the seams on parasol canopies are sewn in a particular manner that I assume gives them both strength and flexibility. While I haven't done an extensive survey, my experience, and that of my parasol mentor, Lynne Taylor, indicates that this method is nearly ubiquitous. I've seen it even on hand-stitched canopies. 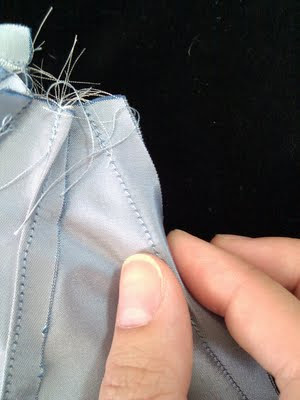 1: stitch the seam, using a small stitch length. 2: fold the seam allowance under. 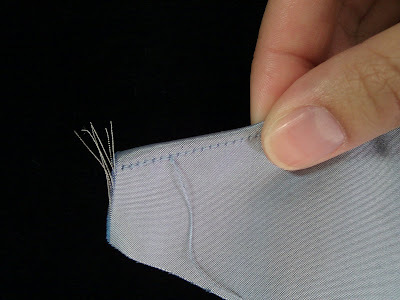 3: stitch over the seam and the folded allowance. Try to stitch on to of the first stitches, or slightly towards the seam allowance. 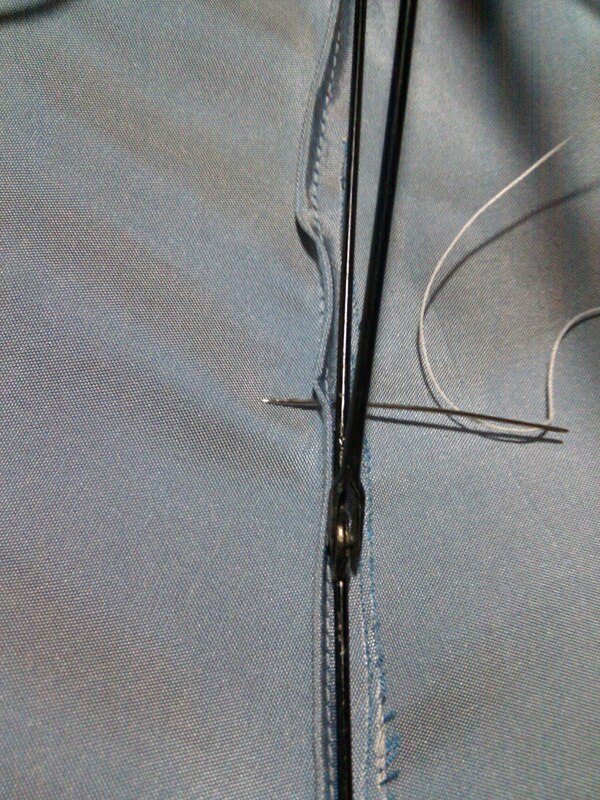 4: what the seam looks like on the other side. 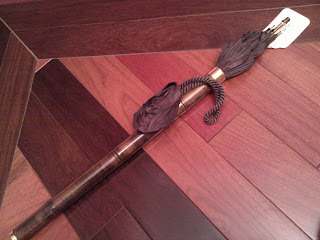 Since this parasol restoration has turned from "to-do" to "in progress", I'll chat about it some more soon. Costume College ended nearly a week ago, and I've been so abominably busy that I haven't had time to write about it! Of course, it was a BLAST. There is nothing quite equal to a full weekend spent among fellow costumers. I always come away overwhelmed by the creative energy, and with sore cheeks from continually grinning at the fabulousness I see everywhere. Classes: I managed to land FOUR limited attended classes, but while I learned some new and nifty things, I've decided that trying to get as many limited classes as possible is not the best Costume college strategy. I missed some really great unlimited classes, and also missed circulating and socializing (my favorite Costume College activity). I also taught a class this year, which made me too anxious to enjoy a class or two beforehand (but I'm not dissuaded from teaching again next year). But anyway, here's what I created over the weekend. 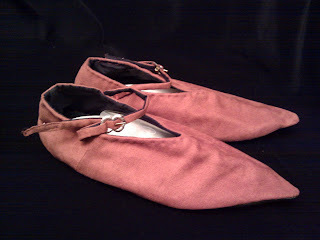 Friday I spent the whole deal making a pair of Medieval turnshoes with instructor Kathryn Wolters. The uppers are microsuede, I believe, the soles are leather, and the interior is cotton or a cotton blend. The tiny buckle is hand-cast pewter. They're built over three-quarter insoles, because my feet would hate me if I ran around in these with no support. I would have finished these in class, but was stymied by the silly little straps. The last bit only took a few more minutes after class. Saturday mid-day I took Boutis Provençal with Natalie Meyer. This is a technique similar to trapunto, but it leaves no holes in the back of the fabric. It was new to me, and I picture interesting possibilities with it. This I did not finish until several days after Costume College, and it took a very long time, despite that it's only about five inches square. I'll probably work this sampler into a thrown pillow or hand bag in the future. Saturday afternoon I taught my class, Basic Lucet Weaving. It went...ok, I suppose. It could have gone better, and I got some ideas about how to do it better next time. 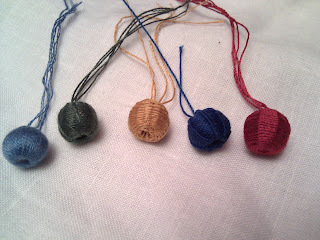 Sunday morning...early...I took Medieval and Renaissance Thread-Covered Buttons with Christine Megowan. From left to right: vertical wrap, horizontal wrap with half-exposed spines, basket woven,outside loop, inside loop (names made up by me). Sunday afternoon I took Make a Calash Bonnet with Janea Whitacker. Pieces of a calash bonnet. Unfortunately, this is exactly as far as I got. With only about three hours of class time, and doing all stitching by hand (and running in and out to collect my display from the exhibit room and visit the dealer room), I only managed to finish two channels and to attached the lining (pink) to the exterior (green). Oh well, onto the "to-do" pile it goes.